Wall Yoga helps you accomplish so much more than if you do it alone. I had never heard of Wall Yoga. Did you? If you have, and you have practiced Yoga at the wall, you are lucky. Let me tell you about my introduction and my experience with it. Normally I prefer to do my own Yoga practice at home, so I can truly attend to the areas that I need. But I was stuck, and finding it difficult to motivate myself. So, I thought it was time again, to learn something new. I hadn’t been to a class in awhile. I needed a a catalyst, a spark to light me up again. I had no recommendation for the studio that I choose this time around. In fact, I found it through a Groupon e-mail. The introductory price was great and I thought, why not? If it is a lousy place, I hadn't spent much money. It was very close to my house, an added bonus. Off I went to class, to stimulate my Yoga practice. The first class I attended, (it was dead in the middle of the summer), there was a fill-in instructor. She introduced herself, but all my classmates whispered to one another, and NOT ONE person introduced themselves to me. Hmm… this wasn’t going to work out. Some community? However, I chose to persist with this studio. As it turned out, the regular teachers were great, and I was learning a lot. We started out slowly and carefully, doing very basic Yoga poses, using the wall as a backdrop. All poses we did were against the wall. We began our Wall Yoga with the lotus pose, backs against the wall. When instructed to flatten my back against the wall, and really press my sit bones into the mat, I thought, "This is going to be a piece of cake! Wish I hadn’t come." Then, as I turned my attention to my body, and its response to the support of the wall, I began to sense a change. I kept going into this new sensation. I thought, “I am supported and this really feels great.” I could really elongate my spine and my neck as I flattened my back against the wall, which was my new support. I could really grind my sit bones into the earth. I had to focus to open my shoulders to feel the wall against them as I flattened my back even more. My spine was erect and strong. I felt a new energy. I loved it. I quickly discovered that when I did basic Yoga poses without the wall that I was indeed cheating a lot! 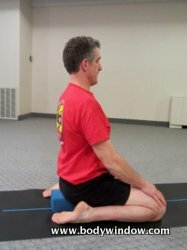 My lotus pose, done so frequently, often gets a bit hunched through the back and shoulders, and I didn’t really realize I was cheating so badly. Argh! A new revelation, indeed! With the support of the wall, I felt like a new person. 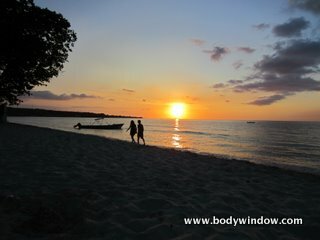 We progressed to basic standing poses, the Mountain Pose, Warrior II, Side Angle Pose, Triangle Pose and Half-moon Pose. All the time we were to focus on keeping our hips firmly squared against the wall and when indicated, shoulders wide and open against the wall as well. All the time wonderfully supported. I loved it even more. No more cheating for me with Yoga at the wall to correct me. 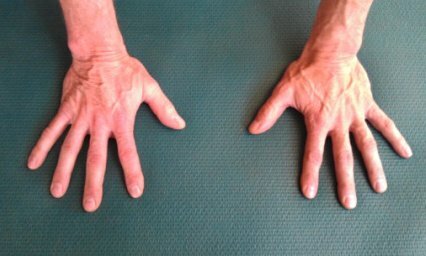 As I focused on these new corrected Yoga at the wall postures, I found that holding this correction took different muscles and a newer inner strength. Yet, mysteriously, it felt amazingly supported by the wall! Wall Yoga really does build character! I could lunge deeper and bend farther with the support. I continued to be amazed as my whole body was feeling a new aliveness from the Wall Yoga and the support that it offered me. After doing the supported, standing basic Yoga poses, my legs were all tingly. It felt so wonderful. Tingles! Amazing. I couldn’t remember the last time I got tingly over something. I especially loved the Chair Pose in Yoga at the wall. 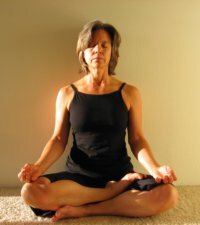 It was a modified Chair Pose so that your upper body was upright, shoulders and hips, again square and open against the wall. Like the old sit-against-the wall-strength-exercise. To make it more difficult, we raised our arms overhead. Marvelous feeling. I actually felt like I could hold it forever, as my character swelled with energy. We progressed to the Wide-Legged Forward Bend, Legs Straight Up the Wall, Legs Bent Against the Wall and the Shoulder Stand (with or without the support of the wall). I loved it all. If you can't do a full Shoulder Stand, doing one with Yoga at the wall is a great way to modify it and still get the full benefits of the inversion. Do NOT do the Shoulder Stand if you have neck or upper back problems, or if you are menstruating. Start by lying down on the floor, with your legs up the wall and your buttocks in towards the wall as close as you can. Place your feet on the wall, so your lower legs are at a 90 degree angle with your thighs. Lift your hips as you push against the wall with your feet, slowly at first to test if your body wants to do this. If you are OK with this, keep lifting your hips as high as you are able, ensuring that your neck stays elongated. You can prop your hips on your hands if you wish. Disappointingly, in our Wall Yoga, we did not practice Headstands. I couldn’t wait to rush home to practice the Headstand. I have been avoiding it lately, as I haven’t wanted to turn my world upside down. However, with Yoga at the wall, I am sure the support will make it easier. I know that when supported, I can handle what life has to offer so much better. A great metaphor (If you desire, click here to learn more about metaphors and why they are important in bodywork). What a great quote! Wall Yoga helped me see an area of resistance in my life more clearly. Support from God/the Universe has always been one of my issues. I literally have to bend my strong will to release it to God/the Universe. I have a difficult time releasing to the bigger and better possibilities that exist in the great soup of Presence. The possibilities that are bigger than my small left-brain that tries to always drive me forward. With Wall Yoga, I now have a way to practice the experience of being supported. I reach for God/the Universe for support through the symbolism of the Wall. It reaches down to support me too. Wall Yoga just makes it easier to acknowledge. At least for me. The independent one. Yoga straps and yoga blocks are marvelous tools to help align you and support you. However, when you are feeling even more unsupported, try Yoga at the wall. Feel the tingling of the loving support from something outside you, yet supporting you to make you stronger. Use the “Wall” to help you find your Energy from above and within. May you find Wall Yoga as supportive, nurturing and energizing as I do! Please voice your opinion on the matter. Leave me a comment in the box below.